Stealth.com introduces its most powerful mini PC to date, the LPC-680 LittlePC. You can find the full specifications over here. Stealth.com Inc. (Stealth Computer) a leading ISO 9001 manufacturer of industrial rugged computers and peripherals has released their most powerful and advanced mini pc yet, the LPC-680 LittlePC. 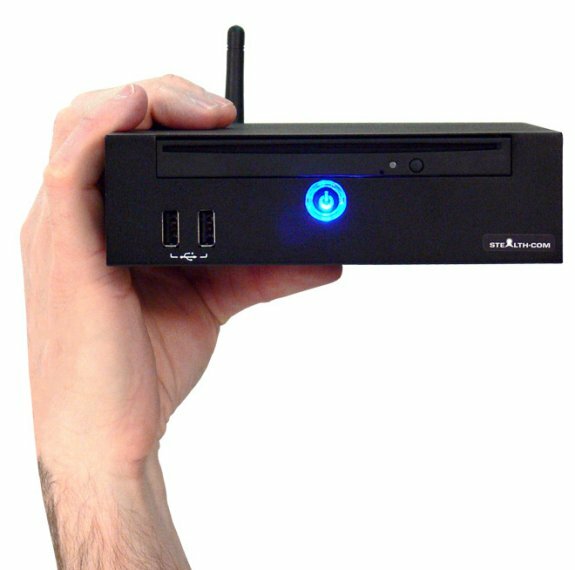 The new Stealth LPC-680 small form factor PC offers tremendous power in a tiny package that measures 6.5" x 6" and less than 2" in height. The diminutive machine is about the size of a hard cover novel yet it surpasses the performance of computers many times its physical size. "The Stealth Model: LPC-680 is the most powerful and advanced small form PC we have offered to date. Our full featured machine utilizes the new second generation Sandy Bridge Intel Core i7/i5/i3 mobile processor family and we believe it competes for the most processing power per square inch of any personal computer available today. It is also our first small PC with USB 3.0 connectivity" stated Ed Boutilier CEO of Stealth.com Inc. The LPC-680 mini PC features a multitude of I/O connectivity built into its impressively small design such as; 2-USB 3.0, 2-USB 2.0, 1-DVI-I, 1-DisplayPort, 1-Gigabit LAN, Wi-Fi 802.11n, 1-RS232 Serial and Line In/Out Audio ports. The LPC-680 supports up to 8GB in DDR3 memory and has a built-in 2.5" mobile hard drive with up to 750GB's of storage space for archived data. For applications that require extra high shock, vibration and wide temperature ranges SSD (Solid State Hard Drive) are available as an option. A slim DVD/CD-RW optical drive comes standard with an optional Blu-ray burner available. The LPC-680 operates from an external 20VDC power adapter (included) or can be connected to an external DC source of 12 to 20VDC, ideal for mobile and in-vehicle applications. Systems are compatible with Microsoft Windows 7/XP, Linux etc and can be custom configured to meet the exact needs of the end user. Stealth's new LPC-680 Small Form PC is currently shipping with a base price starting at $1,495.00 USD. Stealth products are ideal for demanding applications within the Industrial, Commercial, Scientific Research, Military, Public Safety, Utility, Transportation, mining and Telecommunications markets.